“You want a better Team? I am on a mission to help everyone on your team realize that they can all lead! 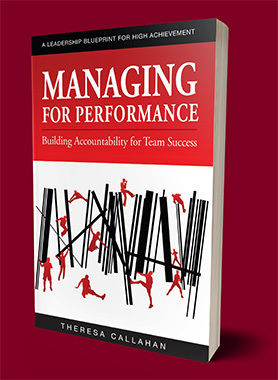 Building a high-performing team is a Team Sport! But it all starts with a bold leader. And leadership isn’t easy for some of us. In fact, for most of us, it’s the hardest part of the job: “The People Stuff”. In my interactive Keynote presentation I invite you to step boldly into your role as a leader and embrace your amazing privilege to lead. This is a high-energy, high-impact event where you will learn powerful shortcuts to improving your leadership effectiveness by implementing 7 Simple Actions that will help you be a better leader and transform team results! 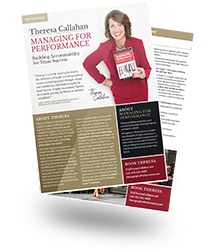 Theresa Delivers Leadership Coaching Live! Having me, an Executive Coach, deliver your Keynote speech means that everyone in the audience will be participating in live coaching exercises that will help them be introspective and self-assess their level of satisfaction in their role as the leader of their team. I like to help my audience lighten up, laugh, and I challenge them to make powerful mindset shifts in their role as a leader. I will use our time together to learn, share and grow. Participants who meet me for the first time like to engage me at the breaks and after our event, sharing their stories with me. They feel understood, acknowledged and less isolated by learning that they are not alone as a leader, and that there are many new strategies that can help them break through barriers and be more effective in their roles. I connect well with my groups, because the participants know I understand their challenges, their struggles and their people problems at work. I share my stories, my personal leadership lessons learned, and the lessons of the hundreds of business owners and team leaders I have worked with over many years, and these stories resonate and inspire. My audience will walk away with new strategies that will help them build a high-performing team of players who are engaged, committed and aligned. And they will have a lot of fun in the process! Schedule an introductory call with me to find out if I’m a great “fit” for your event. I look forward to engaging your audience! Submit a request to have Theresa Callahan speak at your event on our Contact page. Leadership can be lonely and frustrating, especially for small business owners who are striving to lead and manage their people and are challenged with inconsistent results. That old saying, “It’s lonely at the top”, is true. It’s isolating. And one of the best things I ever did was hire a coach. In fact, I’ve had many over the years. It’s the only thing that’s kept me on my entrepreneurial track. My coaches have kept me accountable, focused, moving forward. And those moments when I was about to give up, it’s always been one of my coaches that gets me back on track.